Hi! I would like to validate a textfield to have a url like address.com or address.com . I found code to prevent a URL (below) can you help me change it to accept a URL only? Thank you! if (message=='') message = "A hyperlink was entered! \n"
If I understood correctly, you have code to prevent url form being submitted, but you want to modify it so that it checks that URL is what is being submitted. if (message=='') message = "Please enter URL! \n"
Let me know whether it works as you wanted. Is it not possible to save this script in the script library of BF to be able to use it in all the URL fields of all forms created? I did some tests by taking example on other validation scripts but the submission is inactive. I suppose a subtle mistake is the reason. It is possible to save this script in the script library of BF to be able to use it in all the URL fields of all forms created. To do so, go to BreezingForms > Manage Scripts. There click on new and fill in the fields like in the picture below. Let me know whether you have managed to write the script so that you can use it for validating form fields. This is actually the code I inserted in my validation script. 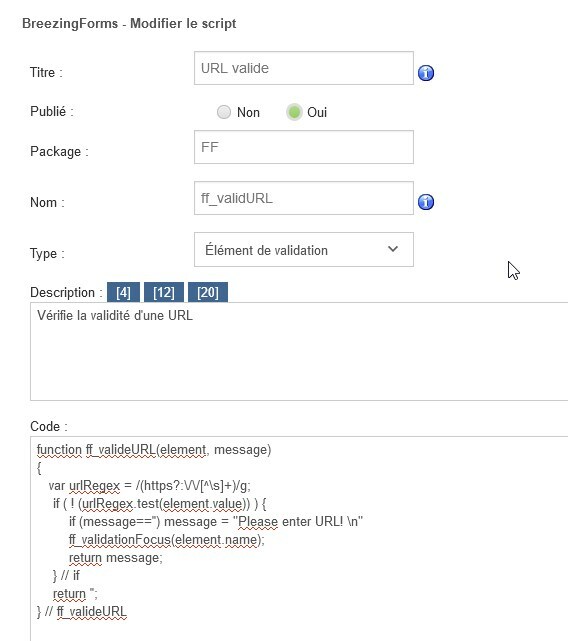 If I create a text field to receive a URL and give it the validation FF :: ff_validURL and validate without entering any text, I do not have an error message and whatever happens, the button submission is inoperative. in case no value is entered in that field. I think I see where is the cause of this not working form your screenshot. Now I've noticed that the name of the script is "ff_validURL" while the function that you have defined is "ff_valideURL". Function and script name must be the same. Please try to adjust this and let me know whether after that the script is working properly.